I have been in Japan a long time. It is my country now (whatever everyone else may think). So, I get upset when Japan is insulted. And I find this advert for "The Cove" or its agenda really insulting. I am not keen on making animals suffer. I have lived and worked in the proximity of sheep, cows and pigs. They strike me as being very intelligent. They all seem "aware" in one way or another. Sheep have friends, even human friends. They ball their guts out when they loose their children. Cows have character. They are certainly sensitive. Pigs, well they are as intelligent at least as dogs. They almost seem to have a sense of humour. And yet I eat them, my friends. Many of the people who appear in the video above also eat the bodies of "my friends". Hell, indeed, we are all watching the Internet when children are dying. Human children are dying, for the lack of an injection, a bowl of rice. And snakes are eating mice. And spiders are eating flies. What am I getting at? I am all for those that point out and do something about suffering. But when a bunch of cow-eaters come to the other side of the world to 'expose' and talk about the suffering caused by an out-group, an other, a victimisable, demonisable other, that gets my goat. I posted the following to an English language news website below an article about the dolphin hunt in Taji, where, above my comment anglophones had called for questions to be asked of at the forthcoming Taji council meeting, and had expressed distress about the hacking to death of dolphins. Here are the questions I would like asked. What is wrong with blood and hacking? Is it the colour? The arm movements? Or the suffering? Are animals being brought up in coffin sized cages for *all their lives* and then being shipped, herded, and finally electrocuted, squealing, suffering any less? Or perhaps infinitely more? Which would you prefer, what would anyone, any animal prefer: freedom while being hunted, or a a whole life in coffin-sized enclosure with a 'quick' bolt to the brain waiting at the end? Do you now what percentage of 'humanely slaughtered cows' are alive as they are turned into steak? Don't you feel inclined to take the moat out your compatriot's eyes first? Does having saved a human represent any acid test of inedibleness? Does eating dogs t herefore represent bararity? Don't many creatures live in harmony with each other, helping each other? Do we therefore not eat all the helpers? Is it only helpers of humans that should not be eaten? What is it about dolphins that you find so inedible? What is it about cows and pigs and chickens that makes them so low, so infinately low, that one can torture them and slaughter them for so much longer in so vastly greater a quantity? For the sake of reducing animal suffering, don't you wish that all the animal protien in the world was obtained by the hunt of wild species, rather than life-long-box-tortured animals? Are you or your supporters using this movement, their interest in this movement, as an excuse, a way of forgetting the vastly more grotesque, torturous slaughter of enourmous proportion going on in your own countries? Do you realise that your dolphin lovin' cow-torturin' cultural hypocracy turns some folks' stomachs? Does demonising the killing of animals in another country help to reduce animal suffering, or encourage people to forget the torture going on in their kitchen? Are you for real? Do you have no shame? The English language media outlet in question immediately censored my post above as being irrelevant. So I post it here. I don't approve of hacking, bludgeoning, electocuting, captiuve-bolt-pistolling anything to death, and even less doing after keeping that thing, that animal in a cage all its life. I approve even less of the "projection" in freudian terms, going on the above video because I think that it lets the suffering continue. By presenting the suffering as something that takes place elsewhere, upon animals that oneself does not slaughter, it enables these fine celebrities, and their fans, to ignore what is going on around them. Social Loafing is the name of "the first" social psychological phenomena, wherein those working as a member of a team, such as pulling a rope, are less likely to put their back into it as when they are pulling the rope on their own. There is research to show that in Asian countries (but not this photograph!) reverse social loafing or 'social trying' is also found (Karau & Williams 1993). Other Japanese research (Kugihara, N., 1998) shows that Japanese men are inclined to engage in Social Loafing but Japanese women are not. And finally Yamagishi's extensive research (e.g. Yamagishi 1998, The structure of Trust) shows that Japanese are likely to engage in social loafing if they are not keeping check on each other, but in a face to face situation where they can censure each other, then they are likely to engage in social loafing (or at least subjects made distribution choices in a game experiment based, apparently, upon these assumptions). If it is the case that, at least in face to face group situations, Japanese are more inclined to try harder when in a group, then I presume that this has big implications for management and education theory where social loafing theory encourages the individualisation of tasks, reward and responsibility so as to maximise individual pride in outcomes, and gains in self-esteem, and to minimise social loafing. I thought it was only me that got pissed off with the way that all till operators use ones change as a paper weight for the receipt that few people want. 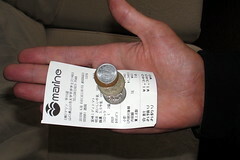 If you are holdilng your purchase in your other hand it is difficult to throw the reciept away without dropping your change. I found out recently that a Japanese 'comic folk band' Briefs and Trunks complained about this in their hit song Konbini (Convenience Store). But still the tellers keep doing it, at every store in Japan. The main reasons for this beahviour is, that if you are going to give someone a reciept into their single outstretched hand, there is very little option. If the teller were to put the reciept on to of the change, it would probably fall off. The issue is not so much where their put the reciept, but that they give it to you at all. Do I look like I want a reciept for my ice lolly? The cultural issue focuses on the importance of reciepts and the reasons for them are more complex. So many people, especially housewives keep detailed accounts of all their expenditure so treasure their reciepts, Japanese like visual signs and a visual record of a transaction, Japanese people like to exchange so even though there is a transaction of money for goods the reciept is another thing that the buyer gets in return for their money, even though Japan is one of the safest most crime free places in the world (and one of the reasons why it so) the Japanese like to avoid conflict at all costs and the existence of a receipt reduces potential conflict over the amount tendered, the Japanese like little pieces of paper (which is a homonym for God), the Japanese like wrapping (see "Wrapping Culture" by Joy Hendry) and perhaps the reciept wraps the deal.